Forum » The Community » Comics, Podcasts & Review - Oh My! » Comic 289 - "VEDA"
Topic: Comic 289 - "VEDA"
Errol: VEDA is Vlog Every Day in April, and was started by this person. I figured I would do it because ... uh... I dunno. Although I was out for sushi with Manda and Mai Sheri joined us and Mai Sheri introduced us to it. So it seemed fun to do! 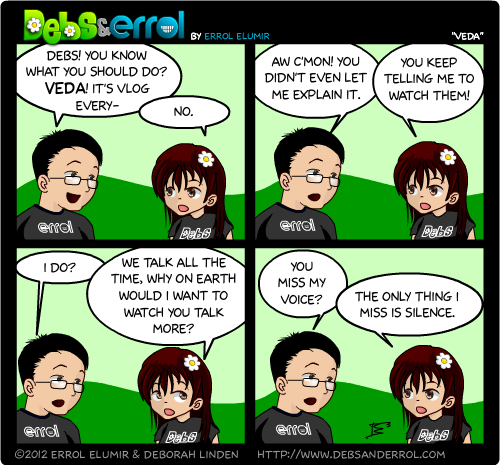 Re: Comic 289 - "VEDA"
It's a video... every day? Didn't you go through this kind of torture already with NaNo and then FAWM? Seriously, in 2 years there will be a thing every month, and nothing will EVER GET DONE! Suprised your not doing Script Frenzy! And Kelson, VEDA isn't hard! It's just 5 minutes of my time a day! Ok... 10 minutes really, but still! Not hard at all! Manda-pants is tired. This amuses me. It's fun to watch this then follow it up with her CivV letter, they look the same. Tiredness happens to all of us, but Manda can at least manage to keep the spark of awesome whilst tired- which few other people can. Manda is awesome. 😀 I want to do more things with manda! Everyone should get themselves a manda!